3. Derive the equation of motion for viscous damping. 6. In a two storey building frame, the mass M1 = M2 = 1000 Kg and stiffness are k1 = k2 = 1 MN/m. 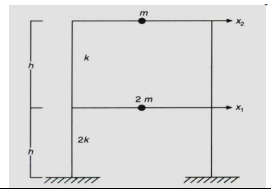 If a horizontal force of 20 kN is applied at The top of ground storey level, Estimate the displacement of the masses M1, M2. 7. A three spring mass system is shown on figure. All the masses are subjected to dynamic forces. Develop the equation of motion in terms of displacements x1, x2, x3 of the masses along the axis of the springs. 10. Define steady state response and determine the steady state response of the system. 11. i. Explain the seismic waves with neat sketch. 12. i. Explain the types of geological faults. ii. Discuss about the classification of earthquake. 14. i. List out the two approaches followed for the prediction of earthquakes and explain it. 17. Examine the plan configuration problems that affect the performance of RC buildings during earthquake. 21. Write down the design principles involved in design of masonry structure. 24. Why ductility consideration is very important in earthquake resistant design of RC building Explain the ductile detailing considerations in flexural members as per IS 13920-1993. 25. i. List out the design principles of earthquake resistant structure as per IS 1893-2002.
ii. Write in detail about the special confining reinforcement detailing as per IS 13920-1993.